An easy cake recipe made with pineapple, cherry pie filling, a cake mix and nuts. We call it a cake but it eats like a cobbler! I have made some of the neatest foodie friends this year! 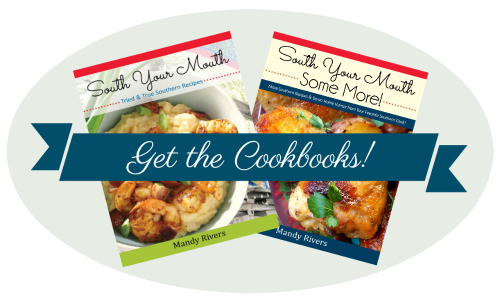 My friend Mary and her son, Noah are proving to be DE-lightful people to cook for and eat with! Noah just turned six but has the palette of a refined Frenchman. I first noticed his appreciation for food when I watched him knock out half a tray of marinated blue crab claws. All the other kids were walking a wide circle around them but Noah knew he’d found something special. Even watching him eat motivates my inner chef. He tastes food the way most people taste fine wine, first putting a little in his mouth and moving it around with his tongue before biting down. I’d love to know what he’s thinking when he’s trying something for the first time. He seems to be as appreciative of contrasts in texture and complimentary flavors as I am. I even find myself thinking about what Noah would like to try rather than what the adult guests will want when we’re having them over and I’m planning out a menu. Anyway, we were at their house Saturday for dinner when Mary’s friend, Jennifer popped over with her family. Jennifer went about dumping some stuff in a baking dish, fired up Mary’s oven and had dessert cooking in under five minutes without skipping a beat. Which was pretty impressive. I love friends like that. Ones who make themselves at home in your kitchen. Jennifer made her Nana’s dump cake for us and it was so good I had to make one for you! We’ve all had dump cakes but this one is a little different than what I’m used to. This one eats more like a cobbler. I started to call it a Cherry Dump Cobbler but if Jennifer’s Nana is anything like my grandmother, you best not be screwing around with family recipes too much. I did change the topping a little. Jennifer topped hers with coconut and walnuts – and it was delicious! – but Husband has threatened to boycott if I don’t lay off the coconut in my desserts for a while so I used sliced almonds (plus almonds and cherries are such a great combination!). If you love this recipe be sure to check out this recipe for Easy Apple Cobbler! Dump cherry pie filling into a 13x9 baking dish and spread evenly. Dump crushed pineapple (with juice or syrup) evenly on top of pie filling. Dump cake mix evenly over fruit. Drizzle melted butter over dry cake mix then top with sliced almonds. Bake at 350 degrees for 45 minutes. Serve hot with ice cream or cold with whipped cream or just enjoy it as-is! Great job to Mom for raising a good eater! I would love to see what sort of recipe ideas Noah has! I would definitely follow Noah's blog! My daughter was an adventuresome eater, then she turned vegetarian at 13. I swear she did it just to drive me crazy! If Noah inspires you, I know I would be as well :) He should definitely have a blog, I would be second to sign up (right after you)! Love this recipe. I think Noah is a cutie pie. He should start a food blog now and maybe he'll grow up to be a famous chef and cookbook author. I think it's a great idea for Noah to start a blog, and I would definitely follow it! What an inspiration he could be to other kiddos! He looks like he could be the next Alton Brown. So adorable, and my 9 yr old daughter Ava would love to read an interact with his blog! She is my inspiration because she is more of a foodie than I am. I made this last night and it was awesome! Going to the kitchen to make it now ! I am such a huge fan of yours ! I made greasy rice for the first time last night, OMG ! Honey, if you've never added bacon grease to it, you MUST ! Good eating right there. Thanks for all you do to inspire us. And ps.....love love love the cookbook ! I've made this recipe with fresh peaches and it's out of sight. I highly recommend it! I little more prep work because you have to do the choppping, but it's worth it. I think a blog with someone young who likes to try all foods would be great. You will have a terrific time growing up and learning as you find new cultures. Is that a rolled newspaper mat under the cake? I love it. Did you make it. If so, how? Lord, no, I'm not crafty! It's just a cloth napkin under the clear baking dish. Love your site, just found it...and have become addicted. 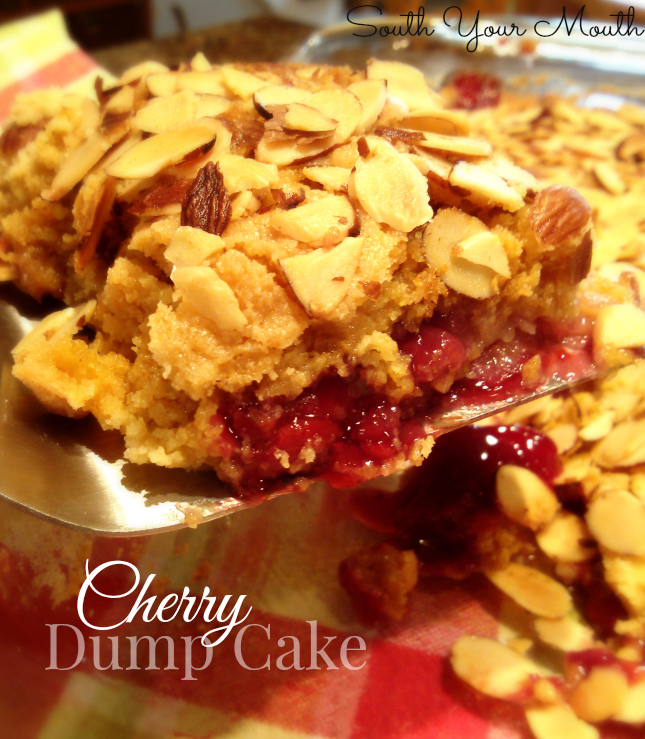 Had to try the cherry dump cake and it was terrific. Just curious if you were tempted to use two cans of cherries? Mine looked lonely in the 9x13 pan. I thought the same thing but since I'd already had Jenn's I knew it would come out great. But I think you could use two and it would be great too! Can I use home canned cherries for this? I'm not sure I know what canned cherries are? If you mean the maraschino cherries in the jar, then I'd say no. You need the "sauce" that comes with the pie filling.